At first, the soldiers called the detention facility “Jorah” (an Arab word meaning pithole, used in colloquial Hebrew for sewage). Every checkpoint has its Jorah. It is a quadrangular concrete fence, of various sizes, according to what the Civilian Administration calls the volume of traffic at the checkpoint, with a small entrance, and usually a roof, too. Reasons for detention are plenty. A Palestinian can be detained because he is, what is often referred to as a “bingo”, that is, blacklisted by the Shabak. It is very easy to get in that blacklist, but I’ll leave that for now, that’s atopic deserving post of its own. 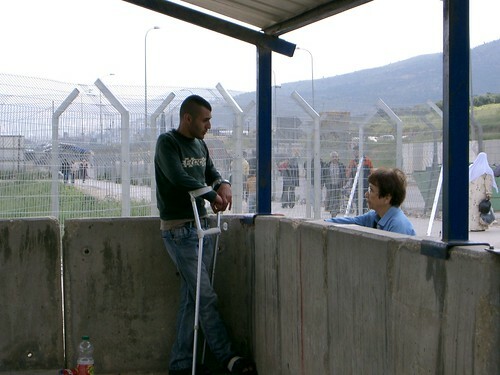 A Palestinian can also be detained because his ID is torn – there is no crossing the checkpoint without an ID – and also because he didn’t stand nicely in line, or because he bypassed the long queue on the exit from Nablus by using the entry road (at Huwwara checkpoint the entry doesn’t require a security check. At Beit-Furik, five minutes away from there by car, the entry does require a check. At Beit-Iba checkpoint a security check is required in both directions. Why? No reason), or by going through the fields. 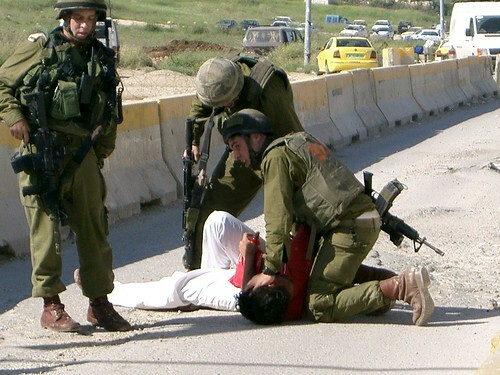 A Palestinian will also be detained if he holds a position that the Civilian Administration considers “problematic”. For example a policeman in the Palestinian police, or a fire-fighter. Or if his belongings include a photo of a Shahid (Arabic for martyr). I saw students detained in the Jorah (or in solitary confinement, see below) because the received at An-Najah, Nablus’s university, propaganda material for the elections of the student body. There are lots of reasons for detention. And it is important to keep in mind – nowhere does the Israeli law specify that Palestinians have to go through the checkpoints. Here is the Jorah at Huwwara checkpoint (south of Nablus). I took this photo on April 2006 (the photos from Huwwara’s Jorah or old because in the last two years detainees in Huwwara have been held in solitary confinement. See below). The detainee in the Jorah is a good friend of mine. He is from the Balata refugee camp. That day he was on his way to see a doctor in Ramallah. He missed his appointment because of the detention. He waited for the soldiers to let him go back to Nablus. He was detained because he tried to obtain permission to leave the West Bank for studies in the US. He was admitted to a program in Film Studies. He told us of this woman in the camp. A love story that can’t be realized, he explained. They sneak in order to meet. He told us that soon she was going to pass through the checkpoint on her way back home: “I’m ashamed to have her see me standing in the Jorah”. Shortly after we saw her, going into Nablus. They exchanged glances. All this happened shortly before the Seder night, the first night of Passover, a few days before a curfew was announced on the whole of the West Bank. A curfew imposed every year in honor of our festival of freedom. And here is the Jorah at Beit Furik (southeast of Nablus). I took this photo on July 2008. This young lady, a minor of 17, went to visit her sister at Nablus. She’s from the village Beit Dajan. Earlier she did groceries at the market of Beita and that’s why she entered from the Huwwara checkpoint, where there is no security check at the entry. Only at her sister’s did she notice she forgot her ID at home. She was afraid to go home through the fields. She decided to take her sister’s ID, hoping the soldiers wouldn’t notice, because of their resemblance. She arranged with her sister than in the evening her husband would come to fetch the ID. But the soldiers noticed. So she was detained. She called her father, who came to the checkpoint with her ID. When he saw is daughter standing in the Jorah, he started crying. The soldiers refused to let her go. “She deceived us”. The enemy as a young 17-year old lady. Another photo from the Jorah at Beit Furik. I took it on July 2006. A detention of five hours (two hours more than army regulations allow). The detainee was not offered food or water. I was prohibited from going near him. The Jorah at Beit Iba (west of Nablus). The photo is from March 2006. This young man was suspected to be a “bingo”. Three hours later they found out the soldier made a mistake. The name sounded like a name from the blacklist. The young man, who is a student, missed a day of school. Where there is no Jorah or Waiting Pavilion, things are improvised. For example at Za’tara Junction (Tapuah). I took this photo on May 2007. Structural changes at Huwwara checkpoint (to be described in an upcoming post) brought an end to the Jorah /Waiting Pavilion era. Now the detentions are done in solitary confinement. This youngster is an emergency medical technician of the Red Crescent. Personnel of positions that are considered “delicate” are often detained. Photo taken at Huwwara, June 2008. 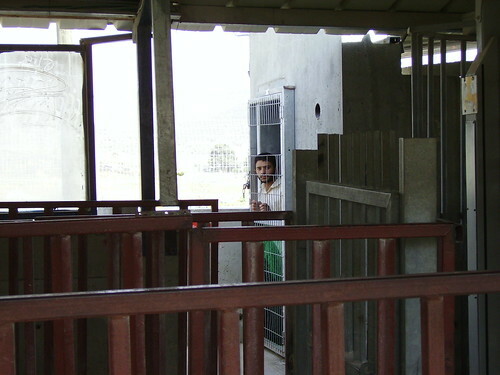 For several weeks the confinement at Huwwara was covered with a green canvas. My friend Judith Levin took this photo on February 2008. 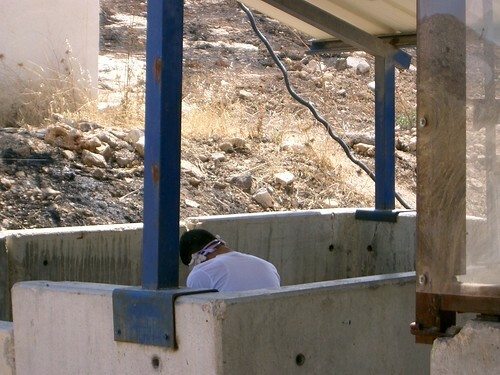 When the solitary confinement was introduced, Palestinian were allowed, not without prior negotiations, to use the Jorah as a waiting and praying area. This is another photo of Judith’s. From June 2008. Note that the gate is open. Sometimes you can do without a Jorah, and without solitary confinement. 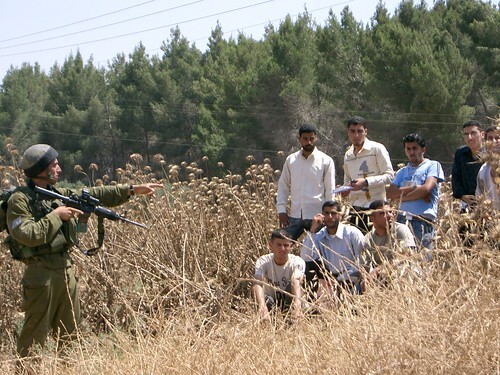 I took this photo on June 2006, at the fields nearby Awarta, not too far from Huwwara checkpoint. Students from the villages returning from a day on campus. Where is it written that they have to pass through a checkpoint? Is there a law prohibiting walking in open fields? The checkpoints are not border ports. The are stationed deep in the West Bank, away from the Green Line. Huwwara checkpoint, for example, is 15.5 miles away from the Green Line. For maps marking the relation between the checkpoints, the Green Line and the settlements, see here. Click here for a Hebrew version of this post. 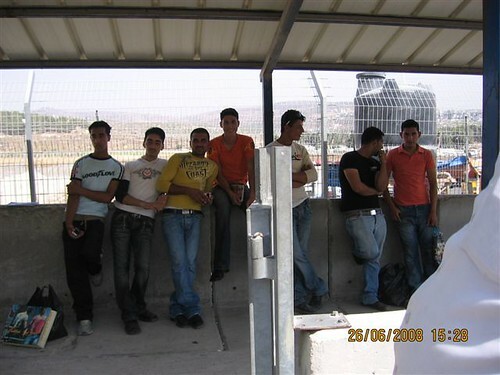 This entry was posted in Uncategorized and tagged Architecture of Occupation, Awarta, Beit Furik, Beit Iba, Children, Detained, Education, Huwwara, IDF Soldiers, Medical Care, Terminology, Waste of Time, Za’tara Junction (Tapuah). Bookmark the permalink. This is very brave. Observers define accountability. Both sides of any situation need witnesses to help reduce injustice. Echoing what was said above — I think this is a great idea for a blog, and a great way of contributing to the often infuriating and ill-informed discussion of “the situation.” Keep it up! This is so hard to read, but it’s necessary to face even this painful reality. Thank you to the author (and translator) for putting this out there. Do you remember that beautiful balcony in Meckold Ganje where we met? You used the word courageous, like you do now. I wasn’t sure back then, and I am not sure now. I am determent to do this. It is just my obligation as a human being. Thank you for your support. It is appreciated. I started writing my Hebrew blog almost a year ago when I realized the gap between the way the checkpoints are described by the mainstream Israeli media and what I actually saw there. I call it today cultivated ignorance. I am happy to see that you agree with me. I agree, We have to face this, we have to oppose it. Everyday. Here in Indonesia I saw the picture and heard about checkpoints in Israel and occupied territories. But never like this. Not the details. Thank you for your courage to tell the real story for us on the other side of the world. Great blog. Look forward to reading/seeing more posts. Thanks, Lucas. We would be happy to meet you here again. Hello Nina, Thank you for your comment. Please refer your friends to our blog, if possible. Welcome, Easeterroks. Very happy for your support. You fail to mention the reason for the checkpoints, which is the murder of nearly 1500 Israel men, women and children over the past ten years by Arab terrorists. Did you know that Passover has been a favorite time to attack, and several years ago approximately 40 people, many of them elderly Holocaust survivors, were murdered while celebrating a seder? That is the reason for the Passover curfew; to prevent it from happening again. Did you know that a seventeen-year-old girl, on at least two occasions, murdered Israel children in Jerusalem and other areas, and several other attacks by teenage girls have been prevented, over the past several years? 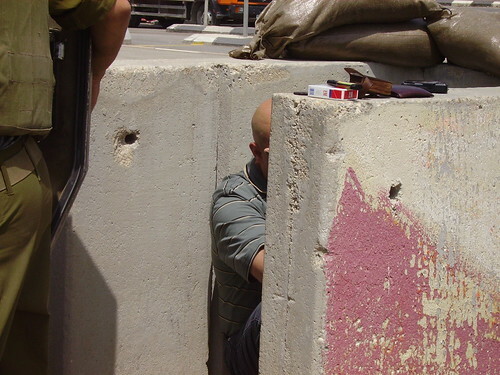 When Arabs carrying out terrorist attacks, Israel will gladly demolish the wall. You confuse cheap rhetoric with facts, which is ironic, considering the sobriquet you’ve chosen. The number of Holocaust survivors, their age, and the percentage among those killed in Park Hotel is irrelevant to the point. Terrorism is abominable and is abominable even if those killed were not in the Holocaust, were neither too young, nor too old, and even if they were all armed, for all I care. Your mention of it only goes to show the emotional, irrational state of your argument. I do not know if you are an official spokesman of the Israeli government. If so, I would appreciate if you could identify yourself. Your last line seems to imply that you know what Israel would do with the wall, and in what emotional state (“gladly”). Let’s stick with the facts, shall we? Israeli politicians have commented more than once (on and off the record) that the wall was not intended only for security, but that it was outlining the borders between Israel and future Palestine, and therefore was intended to impose the form of agreement between Israel and Palestine. 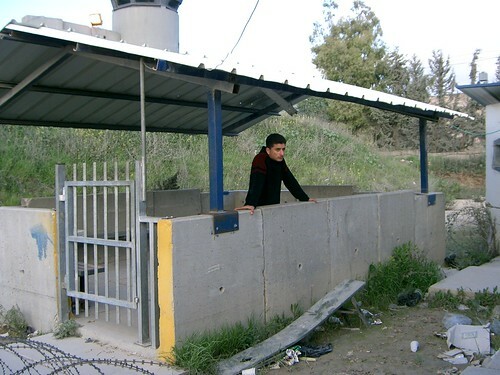 Furthermore, many considerations of the wall have nothing to do with security, as demonstrated in the recent posts of this blog on ‘Azzun ‘Atma, a village that has never been involved in terrorism. Perhaps you believe in preemptive strikes. Perhaps you think that eleven pitas or an extra pound of tomatoes might incite terrorism, and therefore a checkpoint that is monitoring groceries and not armors is in place. Solely for the purpose of security, of course, and that Israel will “gladly” allow more tomatoes, once it is certain the tomatoes will not be used against Israeli soldiers or civilians. Next – even if the checkpoints and the wall were for the sole purpose of preventing terrorism, they would still be wrong. Because they are collective punishment. More Israelis have been killed in recent years by car accidents and by crime than by terrorism. Surely, the effect of the checkpoints and the wall could be implemented to prevent those. But Israelis have this funny concept of a democracy. They don’t want to stand in line all day to be inspected by policemen or soldiers if they’ve done nothing wrong. They want the police to be able to stop those who are threatening they’re lives, and allow all others to conduct their lives freely and peacefully. I realize it is easier for you to lump all the “Arabs” together, not discerning Palestinians from Egyptians, or terrorist Palestinians from innocent civilian Palestinians. But that is immoral and unjustified. Last but not least: yes, Israel is willing to make life unbearable for Palestinians in its struggle with terror. At the same time it strengthens terrorists, when it gives in to Hizbullah, when it halts an operation in Gaza, instead of finishing Hamas off once and for all. Do you truly believe that Israel is fighting terrorism? Does it look that way? The facts seem to point that Israel fosters terrorism in order to justify the peace-process stagnation.